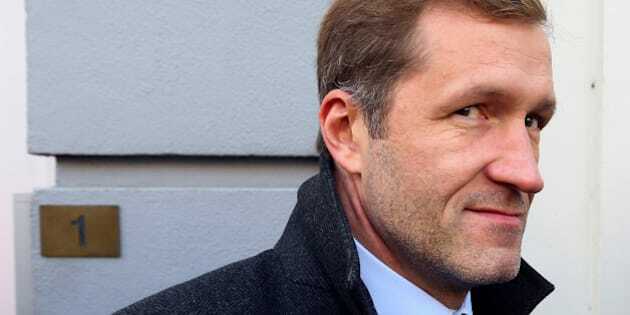 Paul Magnette is not a household name in Canada, but he should be: he is best known for making Chrystia Freeland, our former Trade Minister, cry. Magnette, minister-president of Belgium's French-speaking Wallonia region, raised the ire of the international economic community: How dare a small region like Wallonia bring down the work of 28 other countries? And how dare he challenge a free trade agreement? Well, here's the thing: He vows to do so again. Paul Magnette is not a household name in Canada, but he should be: he is best known for making Chrystia Freeland, our former Trade Minister, cry. Last October, Magnette, sometimes viewed as leader of the “Cuba” of Europe, single-handedly almost brought down CETA, the Comprehensive Economic and Trade Agreement in October between Canada and the European Union, effectively delaying Prime Minister Trudeau’s plans to sign the deal. Magnette, minister-president of Belgium's French-speaking Wallonia region, raised the ire of the international economic community: How dare a small region like Wallonia bring down the work of 28 other countries? And how dare he challenge a free trade agreement? Well, here's the thing: He vows to do so again. Magnette’s recently published book, CETA: Quand Europe déraille,demonstrates that Wallonia’s exercise of examining CETA was everything that Canada’s was not: rigorous, democratic and non-ideological. Wallonia had all the parties sit down together and discuss the issues over a two-year period, with hundreds of hours of hearings featuring experts, lawyers, economists and civil society. In fact, Magnette did not decide to reject CETA on his own: this evolved out of a consensus of most of the political parties in Wallonia’s parliament. I was in Brussels while Wallonia was refusing to give Belgium the authorization to sign CETA, and I met a panoply of politicians from various parties opposed to CETA. Here’s an example of one of their sessions. While free trade supporters are now painting opposition to trade agreements as ill informed, dangerous rhetoric lacking an economic basis, Magnette charges that it is actually free trade supporters who are the demagogues. Extensive pressure was put on Wallonia. The business community said Wallonia was committing economic suicide, was destroying its reputation and would lose foreign investors. An ambassador even went so far as to say that a large company in his country was planning to invest in Wallonia but would pull back unless Wallonia approved CETA. Wallonia argued that it would not accept the EU's timeline and that it was better to postpone the summit. As the pressure built and ultimatums continued, Magnette took a long walk in the woods, shut off his phone for a day, and then turned it back on only to tweet, “Too bad that EU pressure on those blocking the fight against financial fraud was not so intense.” Germany, Austria, Romania and Bulgaria, initially opposed to CETA, gave in one by one under relentless pressure. 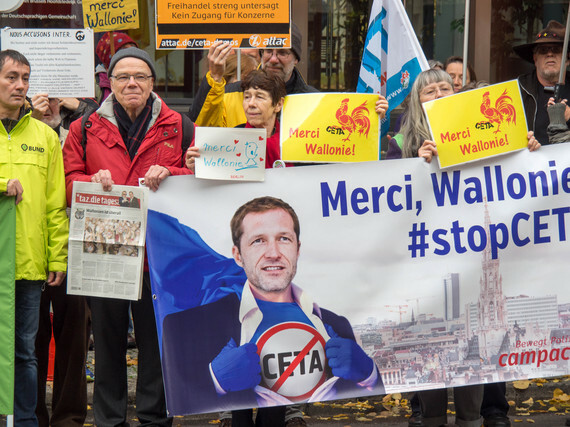 in the agreement, Wallonia (and four other Belgian regions) said they have the right to refuse CETA later in the process, and that if there are no changes to the investor court system, they would reject the agreement. They reiterated their constitutional right to do so. They also committed Belgium to get an opinion from the European Court of Justice on the compatibility of the investor court system with the European Constitution. As recently as last week, Magnette said he would vote against CETA when Belgian’s turn comes to ratify the deal. He is not alone: there are many others. Magnette is actually quite lucid about trade. As a specialist in EU constitutional issues and theories of citizen participation, he is intellectually interested in the phenomenon of multinational companies being granted rights going beyond those of states, and he recognizes the importance of correcting this. He says trade should be balanced against ensuring sustainable development, correcting inequality and eliminating tax evasion. To send a message to Magnette and the people of Wallonia that says the Trudeau government does not speak for you, click here.